With Valentine’s Day a couple days away, there may be some of us who are still frantically searching for that last-minute, yet perfect gift to say “I love you” or “you’re important me.” Roses, flower bouquets, chocolates and teddy bears tend to be the most popular choices each year, but what do you do when you’re looking for something just a little bit more unique? This is when our love of plants can come in handy. A houseplant can be the perfect gift for your special someone. Why? Plants make people feel happy! They can boost your overall mood and well-being, tying into your biophilia – a love of life and the living world. Plants are also extremely beneficial in a home. While they can easily add elegance to a room or a bold pop of color, plants have a variety of practical uses. They can raise humidity levels, improve air quality (by reducing the amount of carbon dioxide and toxic pollutants in the air), and even indicate carbon monoxide levels. If carbon monoxide levels are dangerously high, a spider plant (Chlorophytum comosum) or peace lily (Spathiphyllum spp.) will go limp. 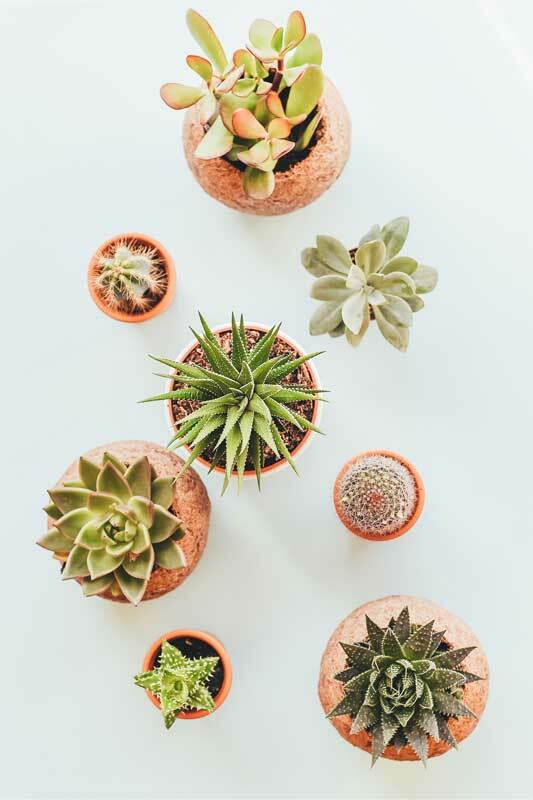 Super popular right now, succulents and cacti are fairly easy to take care of, provided lots of light and little watering. This tropical beauty doesn’t need that much sunlight and only a moderate amount of water to survive. A perfect hanging plant, this climbing, evergreen subshrub produces red, tubular flowers and needs a medium amount of light and watering. 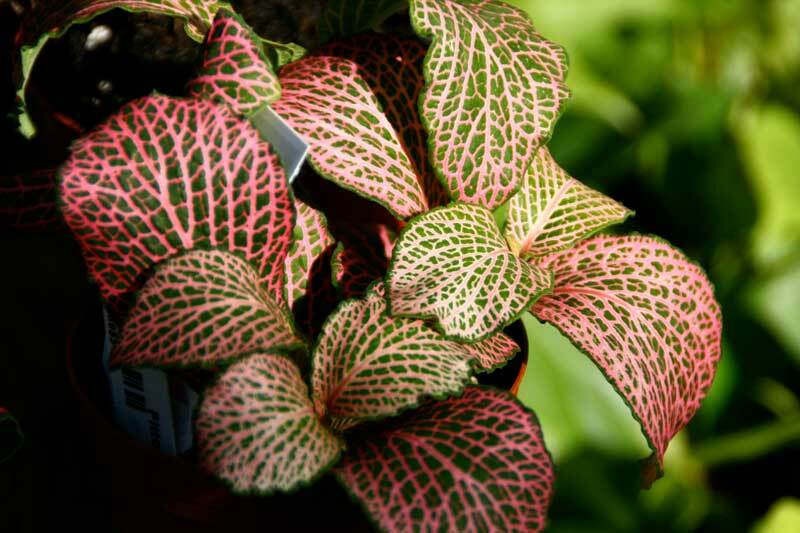 Great for terrariums and tabletops, this tropical houseplant needs medium amounts of light and water and shows off green leaves marked with bright pink, red or white veins. 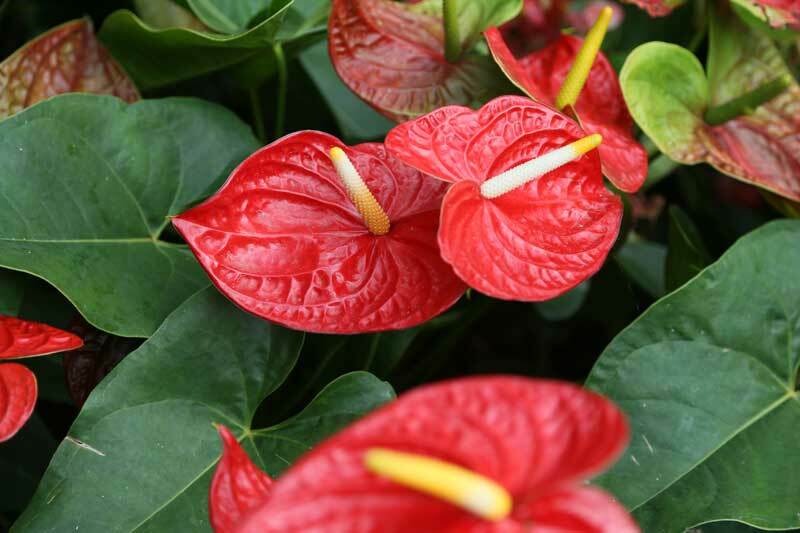 This plant produces a unique bright red flower and needs indirect, medium sunlight and a medium amount of water. Pay attention to how much light houseplants like. Some plants require a high amount of direct sunlight, such as cacti or aloe vera. Other plants like to be tucked away in the corner of a room, away from the sun, such as a dracaena or cast iron plant. 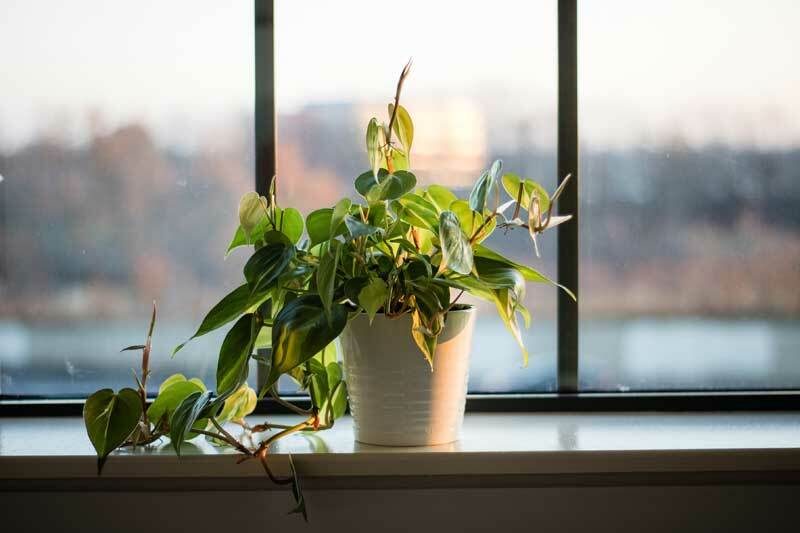 Humidity levels in your house play a key role in whether a houseplant will grow properly. Leave your thermostat at a constant temperature (between 60-65°F). Keep plants away from air conditioner units or heating vents to prevent your plants from drying out. Plants that like high humidity, such as peace lilies, will need to be misted daily. During the summer, air conditioning will allow your plants’ soil to retain moisture longer, meaning less watering whereas during the winter, a heating unit will dry out your plants more often, requiring more watering. Is there enough space in your home? When given the right conditions, plants will thrive and grow to massive sizes. When purchasing a plant, like a weeping fig, be sure to give the plant about 4-5 feet of space for growing room, the same goes for the fiddle leaf fig or a ponytail palm. Other plants, like a wandering jew or a philodendron will need a place to cling onto because of their vining nature. Give these plants a few feet of space and something to grow on. The type of surface a plant sits on is important, too. Some plants will grow to be very heavy, such as a schefflera and should be placed on the ground and not a tabletop. While other houseplants, like a panda plant, will grow a little slower and can be left on a table. It’s important to remember that some houseplants are very toxic to our furry friends, like a sago palm or a Chinese evergreen. It’s your responsibility to research what plants are safe for your pets before bringing them home or gifting them. 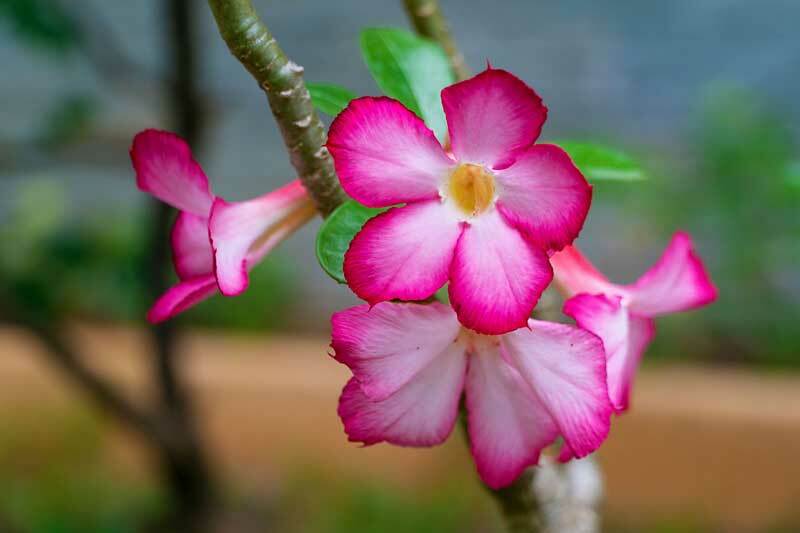 Check out the ASPCA list of toxic and non-toxic plants. If you find yourself out and about most of the time, it’s in your best interest to choose a plant that requires little work, like a jade plant. If you are more of a home-body, then some higher maintenance plants, like orchids, are perfect for you. You can find more information about houseplants and houseplant care on the UW-Extension Horticulture website. Still not sure if a houseplant is the way to go? Check out our 5 Herbs You Can Grow Indoors This Winter blog post to get ideas on herbs you might be able to gift instead. You can also get your valentine a Garden membership or find an upcoming class at the Garden to take together.